The ArchiAfrika foundation recently organised a workshop and conference in Dar es Salaam, Tanzania, entitled ‘Modern Architecture in East Africa around Independence’. Antoni Folkers of ArchiAfrika kept a diary. ArchiAfrika is a foundation set up by a group of Dutch architects who worked in Africa and want to increase knowledge about African architecture in Africa and the rest of the world. During the three-week workshop the participants documented and analysed buildings built in the early 1960s, around the time that Tanzania gained independence. The workshop concluded with a three-day conference. En route to Dar es Salaam, to a workshop and conference on modern architecture in Tanzania and East Africa at the time of independence. A subject about which little is known, either in Europe or Africa. And that is why we – ArchiAfrika – have been studying this subject seriously for the past two-and-a-half years. The workshop and conference are the main achievements to date, but the ultimate aim is to put on an exhibition and produce an academic publication. My fellow ArchiAfrika members Berend van der Lans and Joep Mol, along with project assistant Stephanie Geertman and our Belgian students Bert Lemmens, Pieter Burssens and Daan van Tassel, travelled ahead. To judge by their messages and mails, they worked very hard to ensure a successful workshop for the participating students from Tanzania, Belgium, Netherlands, Nigeria, Poland, Italy and Namibia. 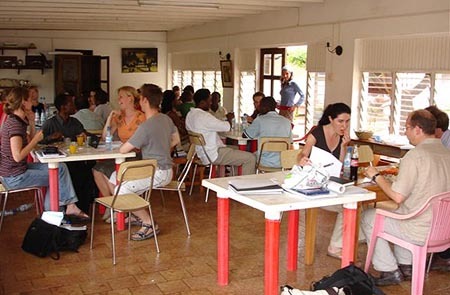 The workshop, which started on July 11, is taking place in a small sleepy hotel called Baobab Village. It has a courtyard shielded from the sun by trees. There’s even a garden with swimming pool, but the pool remains unused throughout our visit. 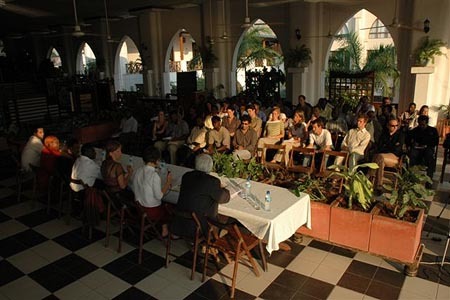 On Sunday evening all workshop participants return from an excursion to Zanzibar. Together we eat biriani and then the organisers meet. In the meantime the students start working on their presentations, which have to be ready by Wednesday morning. 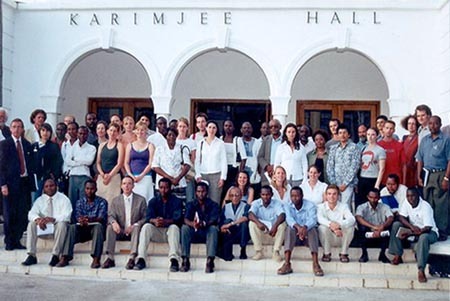 The workshop and conference were originally supposed to take place on the Dar es Salaam university campus. Plans however had to be changed, so we found other accommodation and facilities. Our old friend Nicola Colangelo arranged to stage the workshop at Baobab and the conference at the Slipway, an old shipyard he’s converting into a sort of Italian fishing village. Since the start of the workshop the students have been aided by tutors from the university of Leuven and the universities of technology in Delft and Eindhoven. Frank Koopman from Delft and Jean-Marc Basyn from Leuven got the ball rolling by arranging surveys of the selected buildings according to the DOCOMOMO system. The urban studies are carried out under Jos Bosman and Bruno De Meulder from Eindhoven and Hilde Heynen from Leuven deals with the social aspects. In the evening we visit Anthony Almeida. Almeida is the key figure in our project. 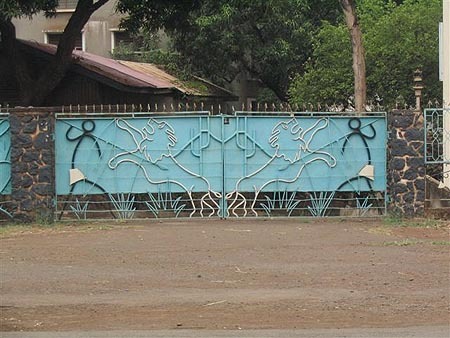 Born in Tanzania (1921) but with roots in Goa, he studied architecture in Bombay. 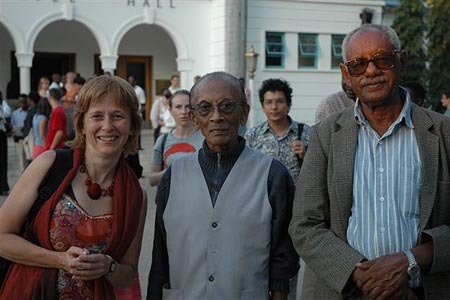 It was there he became a follower of the Modern Movement, which he brought back to Tanzania in 1949. In 1950 he opened his own office, the first by a native architect, and he’s been in practice ever since. His body of work amounts to many hectares of architecture of the highest quality – important buildings that played a role in the remarkable final years of British rule and the first decade of a socialist independent Tanzania led by Nyerere. 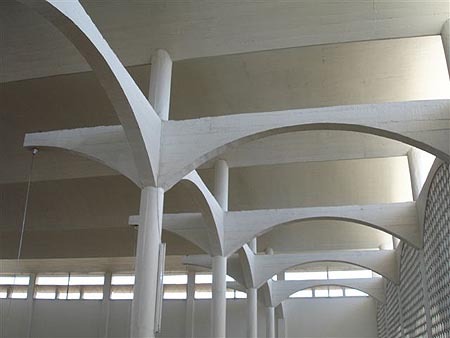 Almeida is elderly and frail, but very pleased that Tanzanian architecture is finally receiving some attention after 55 years of unremitting labour on his part. Today the opening ceremony of the conference has to be organised. 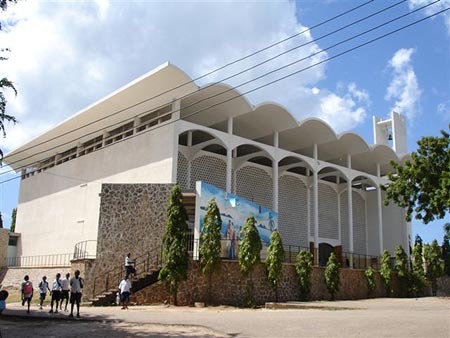 We’ve found a wonderfully symbolic location for the event: Karimjee Hall, the former parliament chamber before parliament relocated to the new capital Dodoma. It’s a monumental space with lots of well-worn red velvet and dark wood. The opening will be performed by Bernard Berendsen, the Dutch ambassador, and Subira Mchumo, president of the Architects Association of Tanzania (AAT). We run through the protocol and speeches. Subira helps us with local contacts and finalising arrangements. Day one of the conference. At the crack of dawn we pick up the panels at Baobab and bring them to the Slipway. They look absolutely great. By nine in the morning the first students and mentors begin to arrive for the presentations, their eyes showing signs of exhaustion. After the presentation we take the panels to Karimjee Hall and arrange them in the place of honour on the front row of seats. At four in the afternoon the conference starts. The turnout isn’t bad but colleagues still have to arrive. All the same, around 80 people are present, and they follow the afternoon’s proceedings with enthusiasm. After welcoming words from Subira and me, it’s the ambassador’s turn. He has some ideas of his own about the project, which is admirable. The highlight of the afternoon comes courtesy of Nnamdi Elleh, professor at the university of Cincinnati. Elleh wrote the first book on the history of African architecture and that’s why we’ve invited him. He whisks us off at breakneck on a journey to Abuja, Yamoussoukro, Dodoma and Casablanca in a gripping lecture that raises many essential questions and themes about Modernism in Africa. Almeida, unannounced, speaks a moving word of thanks. The reception in the garden of the old parliament is a memorable event. Teachers, architects, students and dilettantes are all busy networking. The day the serious work starts. Eight lectures in the morning and afternoon, all followed by discussions. 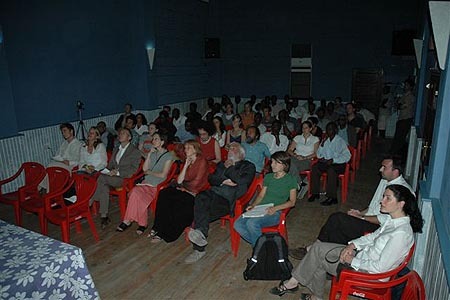 Lectures by European and African academics alternate, and important themes dealt with include the meaning of the modern movement as a Western mission in Africa as well as interpretations of the movement by and/or for Africans. Delegates are busy sounding one another out. The Tanzanians become more numerous and vocal by the session after understandably starting off by sizing up the Dutch/Belgian contingent. In the session by keynote speaker Hannah Leroux, contributions from Sudan, Réunion and Nigeria address modernism and its tenability on the entire African continent. After lunch Hilde Heynen shifts the focus to East Africa with contributions from Kenya and Tanzania, and from our assistant Pieter Burssens. Heynen’s keynote lecture deals with the development of the relationship between the West and Africa in the fields of art and architecture. She expresses very precisely the feelings and doubts that constantly afflict us, the initiators of the conference. The hall is hushed while she speaks and the applause at the end is tremendous. Almeida closes the day with a plea for clarity and modernity. He concludes by putting a question to the new generation, the students. Which side will you take: that of the modernists, the nationalists, or the traditionalists? Preparations for the final day are again running behind schedule so it becomes very late. And where are those DOCOMOMO readers? The last session on Friday morning conducted by keynote speaker Bruno De Meulder deals with the theme of (public) housing and the importance of modernist heritage to Africa today. Contributions from Uganda and from our assistants Bert Lemmens and Daan van Tassel complement De Meulder’s lecture. In his introduction to the plenary session, Jos Bosman offers us his sharp take on the development of modern Dar es Salaam. The plenary discussion has the right vibes. Hilde Heynen chairs the panel and generates an exciting exchange of views and ideas. What strikes me most during the discussion is that this is only the beginning. There is still almost no debate on architecture in (East) Africa. This tentative beginning has raised many interesting matters. The task now is to maintain the effort and classify and channel the raw material that has been gathered. It is clear that intentions are good on all sides, and we can only hope that the project will proceed in a spirit of professionalism. We – ArchiAfrika – are ultimately only the instigators of this process. The DOCOMOMO readers arrive half an hour before the conference ends. The sixty books received are far too few, since more than a hundred people are present. Back at Baobab we dance deep into the night and think back wistfully about an exceptional event.